The first non-stop scheduled flight from Australia to the UK has landed in London – early – after a 17 hour, six minute journey across 9,240 miles (14,875km) from Perth. Qantas flight QF9, a Boeing 787-9 Dreamliner with more than 230 passengers and crew on board, touched down at 5.03am at Heathrow on a chilly Sunday morning to a welcome from ground staff. The landing marked the first commercial passenger jet journey direct between Australia and Europe and has been described as a “game-changer” by some in the aviation industry. The Dreamliner, which Qantas says has 20% better fuel efficiency than similar-sized aircraft, covered the 14,875km with no major dramas. Passengers did have to endure a period of some turbulence as the plane skirted Cyclone Marcus, a storm off the west coast of Australia, shortly after take-off. QF9 departed Perth at approximately 6.57pm local time with the company CEO, Alan Joyce, the Australian trade and tourism minister Steve Ciobo and a pack of journalists on board. On arrival at Heathrow the plane was greeted by a parade of vehicles on the tarmac with lights flashing. After touchdown Captain Lisa Norman, who was one of four working pilots on board, said: “I would like to welcome you to the history book of aviation. 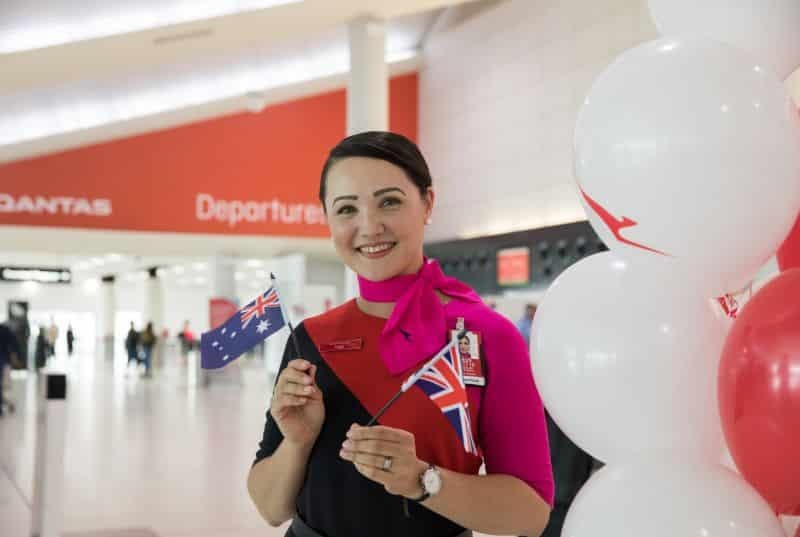 Qantas hopes the inaugural flight will not only open up Western Australia to more British tourists bit also be a precursor to a non-stop journey between London and Sydney. The idea of extreme long-haul travel has also prompted the company to consider new ways to tackle jet lag across multiple time zones. a) The flight lasted seventeen hours and sixteen minutes. b) The journalists on board were seated towards the rear of the aeroplane. c) The plane was a Boeing 787-9 Dreamliner. d) The first non-stop scheduled flight from Australia to Britain has caused a sensation in the aviation world. e) The text concerns the first non-stop scheduled flight from Australia to Britain. f) Captain Lisa Norman felt rather proud as the plane touched down. g) Qantas CEO Alan Joyce congratulated the crew and passengers for arriving on time. h) The goal for Qantas is to achieve a non-stop route between London and Sydney. i) The event was historic because it was the first non-stop scheduled flight from Perth to Britain. j) Captain Lisa Norman was one of five working pilots on board. k) Ten passengers on the first flight recorded normal sleep patterns on their monitors. l) The plane touched down in Europe at 5.03am on Sunday 25th March 2018.
a) The flight lasted seventeen hours and six minutes. g) He congratulated the crew and passengers for making history by achieving the fastest ever flight between Australia and Britain. i) The flight was historic because it was the first non-stop scheduled flight between Australia and Britain. j) False. She was one of four working pilots on board. g) present perfect continuous: The world has been watching us today.